The women endured, and passed, the same tests as the better-known "Mercury 7" male astronauts: suffering through sensory deprivation and tests gauging how long they could keep body parts submerged in near-freezing water. However, just days before the women were to leave for space simulator training, NASA unceremoniously cut them from the program (they were fired by brief telegram - classy). "I think we all wanted to punch somebody," said Beatrice "B" Steadman, 80, one of the 13. Why were they cut? Because they were women. 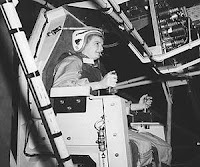 George Low, director of space missions in the 1960s, explained at the time that the women lacked military test pilot experience (they could not be test pilots back then); that letting them use the training equipment would cut down on the men's time; and that enough men were waiting for astronaut slots. Stephanie Nolen's excellent 2002 article for the Globe and Mail describes how Jerry Cobb "the face of the women-in-space program" refused to take her dismissal lying down. She recruited fellow pilot - and wife of a senator - Janey Hart to "bang on doors in Washington." Finally, in July of 1962, they were allowed to testify before a Congressional panel. [Cobb] outlined the medical and scientific reasons why it made sense to use women, then appealed to national pride: "We have seen the reflected pride of the entire free world in the accomplishments of U.S. Astronauts Shepard, Grissom, Glenn and Carpenter. All Americans, and certainly all pilots salute them. Now we who aspire to be women astronauts ask for the opportunity to bring glory to our nation by an American woman becoming first in all the world to make a space flight." The next speaker was introduced as "Mrs. Philip Hart, an excellent wife and mother as well as a pilot." Poised and calm, she spoke lightly but with great seriousness. "It is inconceivable to me that the world of outer space should be restricted to men only, like some sort of stag club." But Ms. Hart knew she could not win this case arguing discrimination; she knew how to play politics. Instead, she arranged her papers, listed off her hundreds of qualifications, and bluntly made her point: "I do not believe there has been any intentional or actual discrimination against women in the astronaut program to date." Since there was no pressing need for more astronauts, "and there is no shortage of well-trained and long-experienced male pilots," there was no need for women. Ms. Cochran had testified to Congress before: In 1943 she defended her WASPs, when critics alleged, among other things, that it was a waste to train them to fly since they just went off and got married anyhow. But now she invoked the exact argument she had once fought: "You are going to have to, of necessity, waste a great deal of money when you take a large group of women in, because you lose them through marriage." A few committee members bridled, noting that this argument would bar women from all the professions - and that all the male astronauts were married with children. "They didn't have [the babies]," Ms. Cochran snapped back. As the committee prepared to break up for the day, she leaned forward with one last comment. "Even if we are second in getting a woman into the new environment," said the greatest female pilot in the country to the members of Congress, "it's better than to take a chance on having women fall flat on their faces." The next day it got worse, with astronaut and future senator John Glenn playing to the committee's prejudices. Then, Col. Glenn smoothly assured the committee that NASA had plenty of astronauts; they weren't looking for more. "[But] if we can find any women that demonstrate that they have better qualification for going into a program that we have going into that program, we would welcome them with open arms," Col. Glenn added. Using that standard - that women must surpass men with their qualifications to be included - it is no surprise that NASA excluded women from astronaut training until 1978. While astronauts are not necessarily scientists or engineers (although many today are), the experiences of the Mercury 13 pilots were mirrored in the male-dominated fields of science and engineering. After being cut from the program, most of the women continued flying, if not professionally then for their own pleasure. Geraldine "Jerrie" Cobb became a missionary pilot in the Amazon jungles, and "holds world records for speed, altitude and distance that were set in the 1950's." Geraldine "Jerri" Sloan Truhill returned to test piloting with husband Joe Truhill at Texas Instruments. After she and the rest of the Mercury 13 were “scuppered by NASA” (as she puts it), she resolved to speak out on radio programs and in the press whenever she witnessed NASA favoring white men over others." She has served as vice president of Air Freighters International and Air Services Inc. "
Rhea Allison Hurrle Woltman stopped flying professionally, but still flies as a hobby. Sarah Lee Gorelick Ratley was not only a pilot, but had a B.S. in mathematics, with minors in physics and chemistry. Ratley eventually became an accountant and continues flying for fun. Marion Dietrich was a writer and reporter for the Oakland Tribune, in addition to piloting in her spare time. She died of cancer in 1974. Jan Dietrich, Marion's identical twin, was a professional pilot, and was one of the first women in the U.S. "to obtain the highest FAA license, the Airline Transport Pilot License." She currently lives near San Francisco. Myrtle "K" Thompson Cagle continued flying, both as an Instructor and with the Civil Air Patrol. Irene Leverton continued to fly, and is currently owns a consulting business, Aviation Resource Management, in Arizona. Gene Nora Stumbough Jessen became a sales demonstration pilot for Beechcraft aircraft and, with her husband, became a Beechcraft dealer. She has served on the Boise Aircraft Commission and as president of the international women's flying group, the Ninety-Nines. Jean Hixson went to work at the Flight Simulator Techniques branch of the USAF Reserve at Wright Patterson AFB in Dayton, Ohio. She retired from the Air Force Reserves in 1982 as a full colonel. She died of cancer in 1984. Mary Wallace "Wally" Funk continued flying, becoming the first female investigator for the National Transportation Safety Board in Washington, DC. eventually got the chance to fly the C. S. T. Apollo Static Space Simulator at Edwards Air Force Base. In 2004 at age 64, she was announced as the first pilot of the Solaris X experimental space craft, Interorbital Systems' entry in the X-Prize competition. Read Funk's full biography on the Ninety-Nines web sit. On Saturday, all thirteen will receive honorary doctorates from the University of Wisconsin at Oshkosh. On Friday, May 11, surviving members will speak about the experiences and answer questions. It's open to the public, so if you are in or near Oshkosh, you should check it out. If you aren't, you can still read the commemorative booklet (pdf) and download the poster (pdf). Rhea Woltman, another member of the 13, said: "I'd rather be flying the spaceship, but that didn't happen. This is next best. I'll take it." Photo: Jerrie Cobb "testing the Gimbal Rig in the Altitude Wind Tunnel in April 1960"
I invite you to read my e-book "An Ordinary Black Cat". Your comments might be very valuable! Don't miss your chance. Good luck!